3tr Group. 3tr into same stitch or space. 5tr Group. 5tr into same stitch or space. Worked in rounds without turning, make 2 pieces the same. Row 4 - Join in colour 2 to top of 3ch on previous row, make 3ch, 1tr into next tr, * 1ch, tr2tog into next tr2tog, * rpt from * to * to end, make 1ch, ss to top of 3ch on beginning of row. Row 6 - ss to first tr, 3ch, work 4tr into same tr, * miss 2tr, 5tr into next tr, * rpt from * to * to last tr, miss last tr, ss to top of 3ch on beginning of row. Fasten off. 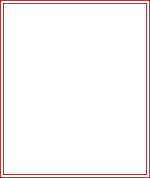 Row 8 - ss to centre tr of group, 3ch, work 6tr into same tr, * miss 4tr, 7tr into next tr, * rpt from * to * to last 2tr, miss last 2tr, ss to top of 3ch on beginning of row. Fasten off. Row 9 - Join in colour 2 to top of 3ch on previous row, make 3ch, 1tr into each tr to end, ss to top of 3ch on beginning of row. (111tr + 3ch) Fasten off. Work second piece the same as first. Do not fasten off after Row 9. Joining Pieces - Place WS of both pieces together and working on RS line up the 3ch's on the start of last row, working through tr's on both pieces, work 1dc into each tr to end to seal the edges, ss to first dc on beginning of row. Fasten off. Fancy Edge - Join in colour 1 with a ss, * make 3ch, miss 1dc, ss to into next dc, * rpt from * to * 25 more times, make 10ch, ss to same dc, rpt from * to * to end, working last ss to first ss on beginning of row. Fasten off. Weave in ends of loose yarn and trim. 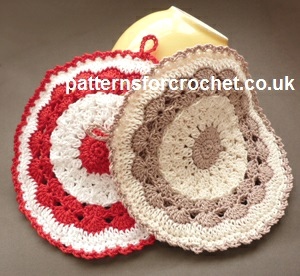 Hope you enjoy this free crochet pattern for a round pot holder.